KIEV, Ukraine -- Opposition lawmakers hurled eggs and smoke bombs inside Ukraine's parliament on Tuesday as the chamber approved an agreement allowing the Russian Navy to extend its stay in a Ukrainian port until 2042. 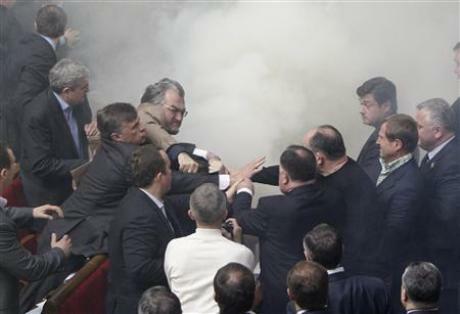 Deputies scuffle during a session in the chamber of the Ukrainian parliament filled with smoke as smoke bombs were released in Kiev April 27, 2010. Thousands of opposition demonstrators rallied outside the parliament building as deputies from newly elected President Viktor Yanukovich's coalition approved a 25-year extension to the Russian Black Sea Fleet's base in Crimea. The chamber of the parliament filled with smoke as smoke bombs were released and Speaker Volodymyr Litvyn took shelter under his umbrella as eggs rained down on him. Ukrainian nationalists, led by former Prime Minister Yulia Tymoshenko and former President Viktor Yushchenko, regard the base as a betrayal of Ukraine's national interests. They wanted to remove it when the existing lease runs out in 2017. But parliament ratified the lease extension by 236 votes -- 10 more than the minimum required for it to pass. Yanukovich agreed the navy base deal with Russian leader Dmitry Medvedev on April 21 in exchange for a 30 percent cut in the price of Russian gas to Ukraine -- a boon to Kiev's struggling economy. In a parallel discussion on Tuesday morning, the Russian Duma was expected to rubber-stamp the deal, which is being touted by the Kremlin as a diplomatic coup. The Russian fleet has been based in Sevastopol since the reign of Catherine the Great in the 18th century. But, under an accord after Ukraine gained independence following the break-up of the Soviet Union, the fleet would have had to leave in 2017. Yushchenko, Yanukovich's pro-Western predecessor who favored Ukrainian membership of NATO, pushed hard when he was in office for the fleet to be withdrawn on time in 2017. But the newly elected Yanukovich says he wants to significantly improve ties with Ukraine's former Soviet master. He says the Black Sea fleet in Crimea does not endanger Ukraine's national interests and enhances European security. Yanukovich's opponents say he is acting against the constitution. But the constitution is ambiguous, containing two contradictory articles on the stationing of foreign military bases in the country. "If society today turns a blind eye to the Kharkiv agreement, it is possible that it will be the biggest loss to our sovereignty and independence," Yushchenko said at the weekend, referring to the meeting in the city of Kharkiv where Yanukovich and Medvedev agreed the deal. The Russian fleet in Sevastopol comprises about 16,200 servicemen, a rocket cruiser, a large destroyer and about 40 other vessels including submarines, landing craft, small destroyers and support ships. To the embarrassment of Yushchenko, the fleet sent warships to support Russian military action against Ukraine's then-ally, the former Soviet republic of Georgia during Russia's brief war there in August 2008. Opponents of the Black Sea deal say that, by hosting the Black Sea fleet, Ukraine could be dragged into future Moscow conflicts with other powers. Proponents point out that the Crimea was part of Russia until then-Soviet leader Nikita Khrushchev gave it to Ukraine in the 1950s. The region retains a strongly Russian-leaning population. Well, it was bound to happen, a brawl at the Rehovna Rada but it was bound to happen sooner or later and some entertainment for Ukraine people.!! A new president and broken promises of the Orange Revolution and the extension of the presence of Russias 7TH until about 2043 definitely had to upset some Ukranians, even some who have sincere feelings for Russia. But the extension and so soon and for such a long time does place a covenant over Ukraine soverignty which could well cause problems in the near future with so many geopolitical changes in Europe. Ukraine media is not very happy with some presidential policies towards the media and this will continue to escalate. True it is a good deal in money but IF there are any major differences or conflicts in the region Ukraine will pay dearly and will not be forgiven easily by other European countries as issues will arise. However,it was good to see the parliamentary members finally let off some steam as it has been brewing and this brawl may just give Ukraine citizens and others worldwide, an idea that everyone does not get along very well at all in the Verkhovna Rada. Too bad Vitali Klitchko was not in on this one as he wants to get into politics because this is one fight he surely would have won. Even Vladimir Putin spoke out saying that no base is worth what Russia is giving up price wise for oil and gas to Ukraine. START agreement between Medvedev and Obama which still must be ratified by both the U.S and the Russian Duma. ..SO, Guess who is coming to Ukraine this week??? benchmark for Russian identity and many policies in Europe and worldwide and he DOES get respect in that area. When one thinks of Russia,one thinks of strength and a firm hand and Putiun definitely is that and no pushover and more convincing than Medvedev as it is becoming ever more clear despite his positive traits. PUTIN is Russia and people know it. There will be ramifications and Ukraine people and parliamentary members will demand why such a long extension as lower oil and gas prices may not even be that important in 2043. It may be best if Yanukovich slows down his pace on some major decisions right now as some will impact on Ukraine for many years and even the best of political analysts and investigative geopolitical reporters and journalists can see but so far. Ukraine should keep all doors and options open as Ukraine people are very frustrated and have been thru a lot. They just want to finally be Ukraine. Russia is definitely on the move and Ukraine must not forget why it declared independence despite their long time neighbor Russia. But,if it were not for a Ukraine there may not even be a Russia today as we know it. causing uneasiness in Ukraine and eastern Europen. Wes Rodgers newsman007 PATRIOTSTV.COM and The Philadelphia Bulletin.! !